This new Bolt DVR may not totally remake the recording technology TiVo is famous for, but it introduces a sharp departure in design and adds features customers have asked for since it started in the late 90s. Just like the leaks suggested, the Bolt is a funky arc-shaped white box that looks different from anything else near your HDTV. Despite being smaller than TiVo's older DVRs -- or whatever cable box you probably have -- it's eye-catching enough for visitors to stop and ask what you're watching TV on. Looks aside, Bolt's main claim to fame will definitely be its ability to bypass commercials with a new SkipMode (No more hidden 30 second skip! We've been asking for this since 2009). That's actually an old trick, and while it's appreciated, where I see evidence of TiVo looking towards the future is the way it's connecting the DVR to Amazon's Fire TV. Let's start with the new hardware. TiVo Bolt will replace the base Roamio (and eventually the Plus), as a 4-tuner DVR that also works for OTA or just streaming TV. For those who prefer six tuners and a larger built-in hard drive, the Roamio Pro will stick around, but it doesn't have the Bolt's 4K or new features. Bolt loses the old analog video outputs and offers only an HDMI port -- no breakout cable either -- which shouldn't be a problem in 2015, but is worth knowing. It has the same integrated TiVo Stream features we dug on the Roamio, and it will work with the existing TiVo Mini boxes to extend the setup beyond your living room. That funky arc shape isn't just there to stick out visually however, as VP Jim Denney told us it also allows the smaller box to vent from the bottom. It's a rather unique design, and in our short time using it the box stayed cool and quiet. The upgraded hardware is good for more than just pixel-pushing too, with apps and menus responding faster than ever. One tweak you'd almost miss? 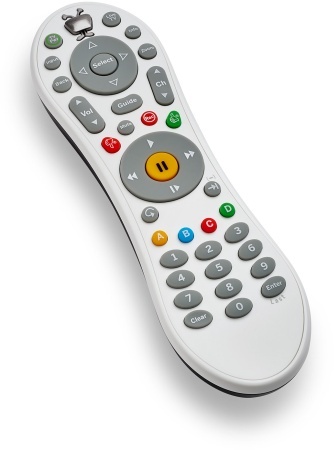 It still has the Roamio Pro's tiny Remote Finder button on the back, perfect for times when the RF-connected control has slipped between couch cushions somewhere. In general, things are the same as they ever were, including stuff like CableCARD setups, and transferring your Series Recordings via TiVo's sometimes-frustrating website. That's definitely one aspect that could use a 2015-style makeover to resemble modernized platforms like iOS, Xbox or Spotify. We tried it out and everything worked without a hitch. TiVo's scheme covers the lions share of our primetime TV programming, and being able to easily skip commercials can make it easier to blow through shows quickly. In that same vein, TiVo is also adding QuickMode (unlike SkipMode, this will be available for the Roamio and Premiere), which lets viewers watch recordings sped up by 30 percent, but pitch corrects the audio so it doesn't sound any different. Many of you told us you listened to the old HD Podcast that way, and we can confirm, if you're bingeing on a series to catch up before the finale, it makes things go by faster without seriously compromising the experience. What we didn't get a chance to try was the Bolt's Ultra HD chops, but according to TiVo it will have two 4K-ready apps at launch: YouTube and Amazon Netflix. At launch, it doesn't have a Hulu Plus app at all. That's an odd omission, but we expect it will be corrected quickly, now that Bolt is going all-in on HTML5-based apps. The menu has been tweaked slightly, and while that change won't be copied onto older hardware, Premiere and Roamio users can expect a guide update that adds more channel logos. Other software tweaks coming in a fall update will bring a personalized "What to Watch" section on iOS, better social sharing on Facebook and Twitter, and a slicker OnePass experience for TiVo Online -- but those aren't the features that piqued my interest. Getting Personal – A Fall update will deliver new features to TiVo's iOS app that will allow you to create a personalized 'What to Watch' screen by selecting categories based on your hobbies and interests. Content matching your interests will then populate your 'My Shows' folder. Share with Friends – TiVo is taking social sharing to the next level. This update will allow you to share a link to your favorite show with all your friends via email, Facebook, Twitter and more. Upon clicking on that link, TiVo will take your friends to a page on an iOS or Android device or on the Web indicating where they can watch that show. TiVo Online – Creating OnePass selections will be easier than ever on TiVo Online with OnePass Quick Select. Upon updating, OnePass will include default options highlighting your favorite programs with a single click. I think the best news of today is that TiVo will finally extend itself to other connected TV boxes. Its iOS app has AirPlay so owners can stream TV to Apple's box but most other devices are entirely left out. It would be better if TiVo created an app for the upcoming Apple TV, but there's no word on that yet. Right now, TiVo says it's working on an app for the Amazon Fire TV. It's not out yet, but when it launches you should be able to watch easily recordings from anywhere else in the home. With a little hacking people have already been doing just that, but official support is a move in the right direction. Making TiVo work smoothly with other devices would make the ecosystem much more valuable, and I hope it's just the start of a trend. Bolt pre-orders start today online -- check the usual sources like Amazon (500GB/1TB) and Best Buy -- with shipments on October 4th, and units should reach retail shelves in the next week or so. The only difference between the two versions offered are the size of the 2.5-inch HDD inside, at 500GB ($299) or 1TB ($399), and both come with the first year of TiVo service included. Is that enough to get buyers away from cable DVRs or custom setups? By including the first year of service TiVo is taking some of the upfront pricing pressure off, which is a big reason why I haven't always recommended it right away. I'd like to see more work done on those apps for other connected devices (Roku, Xbox, PlayStation... Chromecast?) before making the switch full time, but if you're in the mood for an upgrade, the Bolt is a great option right out of the box. Andrew Tarantola contributed to this report.